Green beans that grow on tall poles are not only spectacular fun in the garden, but boy, fresh-steamed green beans are good eatin'! The rule about harvesting pole beans is to check daily, once the first beans appear. Pole beans are a very fast-producing plant. The more you pick, the more beans each vine will make. To pick, use your thumbnail and forefinger to "snip" off the bean from the stem. You can leave the stem on the plant. Have a basket or sack in which to place the picked beans. Of course it's best to eat the beans you picked that very same day, but they will keep on your kitchen counter for a week or so. Another idea, if you harvest more than you can eat: wash the beans and "string" them (see below), then "blanch" them for one minute in boiling water, plunge into a bowl of ice water for another minute to stop the cooking process, and then spread out on a towel to dry. Then store in a sealed zip-lock freezer bag. Once the beans start to ripen, pick in the early morning, after the leaves are dry. Wet bean leaves tend to spread diseases, so try not to touch leaves. Try to harvest when the beans are of medium length, before the seeds bulge; the beans in the picture, below, are a little large and over-ripe. You will probably harvest enough off each pole to make 8-10 servings over the course of the summer and fall. Your "yield" will increase if you keep picking the beans promptly and regularly, when they are medium-sized, to encourage the plant to flower again and make more beans. 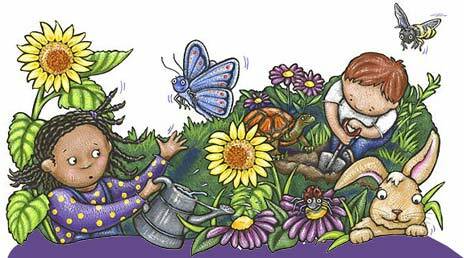 Bean plants may poop out around Labor Day or a little later, if it gets chilly. But if you have a warm autumn, they may continue to bear until the first frost! before you steam them over boiling water for a delicious garden treat. You can serve green beans either whole, as in this picture, or "snapped" into halves or thirds. They call green beans "snap beans" because when they are raw and you break them apart, they make a "snap" sound. 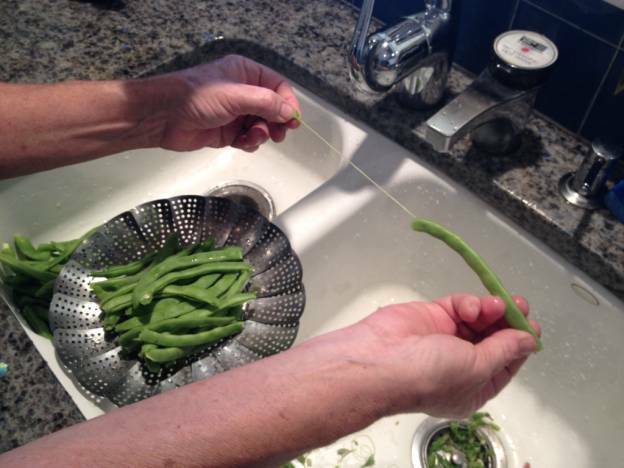 STRINGING BEANS: It's important to remove the "string" that connects the bean pods, before you steam and eat your green beans. It's easy: hold a bean with one hand, and with the other, use the thumbnail to "snap" the curved, "sharp" end of the bean forward and down. Then gently pull, and the string should pull right off in one piece. When you get to the other end of the bean, stop, and use your thumbnail again to snap the other end of the bean forward and down. Then turn the bean over and pull THAT side of the string off. Throw away the strings, and either steam your prepared beans whole, or snap them into halves or thirds. Hint: you can add a few slices of fresh garlic and a lemon slice to the beans as you steam them, and then toss them with a little bit of butter. Mmmmm!!! !